“All those people in their black-and-white worlds- they have no idea what they’re missing” is what the main character, Mia, expressed about her rare ability, synesthesia. 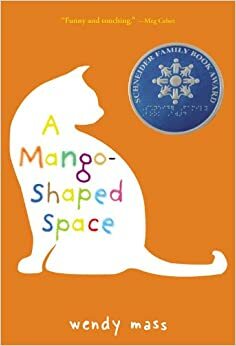 A Mango Shaped Space by Wendy Mass intrigued me with the author’s exceptional imagination and writing skills. It all began when Mia, a third grader who was diagnosed with synesthesia, told the class about seeing colors whenever she saw words and numbers or heard music. At first she thought this happened to everyone, and it was normal. After she was sent home from school because everyone thought she was making it up, she knew she was alone and kept quiet out of embarrassment. It wasn’t until about five years later that she told her parents. The family was concerned and took Mia to many doctors who all thought she was crazy. Finally, they found Jerry, a neurologist familiar with this experience. He informed the Winchells, Mia’s family, about synthesia, an ability where people can see colors when hearing or seeing numbers, letters, or even tasting food and hearing music. Wendy Mass’s novel was well written, although it was not always a page-turner from my perspective. There are some interesting characters, but there wasn’t a climax, a lot of action, or conflicts. One of the more interesting parts was when Mia’s beloved cat, Mango, died. Mango was clearly an incredibly important part of her world, because when he died, Mia lost her abilities to see colors. In the story, Jerry told the Winchell family that in tragic times she may lose them for a period of time. In addition to all of this commotion, Mia had to deal with all her emotions and process more feelings of loss that she had been trying to prevent since her Grandfather left. It was an abrupt, sad period for her. She ultimately had to say goodbye to two of her favorite beings. Furthermore, Mass’s writing style is descriptive but not very fascinating. The whole book was about her figuring out about synthesia. All in all, I liked reading her book but I would rather read a more exciting novel. Overall, I think that A Mango Shaped Space was a bit slow and could have had more action parts to keep the reader engaged. I would recommend the book for anyone who enjoys a descriptive writing style book.